Senior captain Nick Pate has played “exceptional.” Senior captain Sam Winger has stabilized the defensive line and had a “great” year. Junior Clay Lautt has taken over at free safety, been a superb special teams blocker and “way exceeded our expectations.” The Thunder is “really, really smart” along the offensive line. The impressive play has yielded another superlative for the Thunder. “It’s by far the best team that we have had here at St. James,” Radke said. St. James, in its 11th season of football, has quickly grown from a Class 3A to 5A program. The Thunder reached its first and only playoff appearance with a 6-4 record in 2013. St. James is in its final season as an independent before joining the Eastern Kansas League in 2016. On Friday, St. James, ranked No. 5 in Class 5A, opens district play with a home game versus Mill Valley, 5-1 and No. 1 in 5A. St. James lost, 17-14, in the only meeting in school annals last year. Class 5A, District 3 features St. James, Mill Valley, Bonner Springs and KC Turner in the last year of district play for 5A and 6A. The Jaguars, 2-4 entering districts last year, has only lost to Missouri powerhouse Staley, 28-21, and owns victories versus St. Thomas Aquinas and Derby. 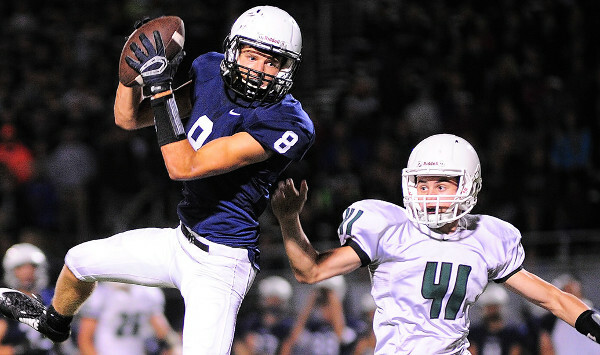 Mill Valley wil join St. James in their move to the EKL next season. Tight end Luke Krull (6-7, 215) will miss the contest with injury. Senior quarterback Logan Koch has a 13 to 2 touchdown to interception ratio with 952 passing yards and 498 rushing yards and eight scores. Mill Valley, led by Division I-caliber offensive lineman Ben Hecht, has averaged 398 yards per contest. The Thunder, with defensive coordinator Mike Consiglio, have posted another strong defensive effort with just 9.2 points per game, slightly better than last year’s 12 per outing average. However, the offense and special teams have significantly increased – and Streeter, a surprise, in arguably the state’s best return man. Streeter was expected to start at defensive back. However, senior running back/returner Jake Burgmeier suffered a high ankle sprain and has missed most of the year but is expected to return Friday. Radke played at Iowa State and was a member of all the special teams units. He coached special teams at Aquinas before he came to St. James. First-year assistant coach Tanner Hageman has taken over the special teams this fall. The Thunder plays multiple starters on special teams, and Lautt has emerged as a great blocker. Mill Valley counters with senior kicker/punter Aaron Hicks. The Jaguars purposefully don’t kick deep every time, but Hicks has 13 touchbacks on 30 kickoffs. He has averaged 36.1 yards per punt with four of 12 inside the opponents’ 20-yard line. A three-year starter, Hicks is 67 of 69 career on extra points and eight of 12 field goals. Offensively, Radke said St. James, with offensive coordinator Matt Joshi, has made a conscious effort to run the ball. In 2014, St. James averaged 164 rushing yards and 4.7 yards per carry. The Thunder has 269 rushing yards a contest and seven yards a carry this fall. Senior quarterback Trey Keith, a returning starter, has thrown for 689 yards with seven touchdowns and two interceptions and leads the squad with 543 rush yards and five scores. St. James is undersized at center-guard especially. However, the Thunder have plenty of intelligence with two seniors and three juniors.